Summit County Government released an ambitious Master Plan for the 130-acre County Commons lot in Frisco on Monday, Jan. 18, following a four-month analysis process. The five-phase project will cost an estimated $70 million-plus and not reach completion until at least 2035. Summit County government released a master plan for the County Commons property on Monday, Jan. 18, setting a 20-year course for continued development of the 130-acre campus in Frisco along Highway 9. The multi-phase project will furnish essential upgrades and additions to several facilities on the 130-acre parcel, county-owned lot that houses a wide array of local services and agencies. Among many others, included in the multitude of organizations: St. Anthony Summit Medical Center and the adjacent Medical Office Building, Summit Stage, the Summit County Community and Senior Center, 911 Dispatch, Search & Rescue, the Colorado Department of Transportation (CDOT), the Main Branch Library and animal control. A four-month process began this past August with contracting Denver-based RNL Design, a multi-disciplinary design and engineering firm, to assist with the project, and included input from the public and nearby residents in Ophir Mountain Village and Bill’s Ranch last October; the county has its long overdue blueprint for the area. No master plan previously existed despite record population increases in the 1970s and doubling in size between 1990 and 2000. Outside of the $120,000 consultant fee paid to RNL, the cost of the entire scheduled two-decades-long concept is estimated at $68.6 million, which is a total based on 2017 dollars, meaning it does not include increases due to inflation. The total projection from the report comprises more than half that amount of money dedicated to aims for a second Medical Office Building, which could be as far out as 2035, while $33 million would go toward the primary focus of the overall project — expansion and improvement to the Light Industrial Campus facilities. Before any ground can be broken, the county must first complete a full-site survey, which it hopes to complete by the end of the upcoming summer. From there, the space’s Planned Unit Development (PUD), last revised in March 2008, will require modification, with it coming a full public comment period. After that, there’s the possibility of construction beginning in 2017, though it’s more likely to start in 2018. Then as part of the initial phase of the plan as it’s currently proposed, a road alignment on Peak One Drive, as suggested by RNL Design, will be undertaken in order to make the route safer as well as create added acreage for the Light Industrial Campus. Also within phase one, the county would construct a new sand/salt building. Neighbors to the operation — where snow plows go to load up on materials to treat the local roadways throughout winter and at all hours — voiced particular concern over the noise- and light-intensive facility; the new plan would move it as far as possible away from Ophir Mountain Village and Bill’s Ranch residents. Additional noise-reducing screens and natural landscaping would also be installed. A new transit building is also baked into the long-term plan. Through the years, manufacturers of the Summit Stage buses have elongated the vehicles, on top of the added bike racks, to the extent that the current size of each bus does not allow for them to be parked back-to-back in a single bay as they once had. So a new facility would be erected and then, during Phase II, the old structure re-allocated for both Road & Bridge and Facilities Management needs. In all, the implementation of each project slated for the Light Industrial Construction zone is calculated to take between three and five years, including construction of new sheriff’s office, search and rescue and water rescue buildings, and demolition of existing structures, as well as the current road and bridge facility. That does not include other projects along the way such as expansion of spaces like the library, community and senior center, animal control and development of a second Medical Office Building. 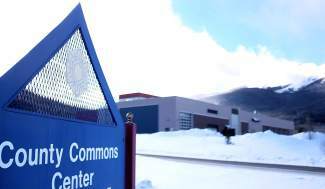 For a look at the entire Summit County Commons Facilities Master Plan Report, visit: http://summitcountyco.gov/DocumentCenter/View/13342.